All your dreams can be fulfilled by taking an instant personal loan. There are multiple Instant personal loan apps available to address your quick cash requirement. Instant personal loan via an app is a fast, hassle-free and paperless way of getting money. Suppose you have emergency cash requirement. The first step you would take is asking friends or relatives for the money, but what happens if the amount is big. You may approach banks for taking a personal loan. Banks generally takes 2-3 days for approval and disbursal of personal loan. If your requirement is urgent you can make use of Instant Personal Loan Apps. 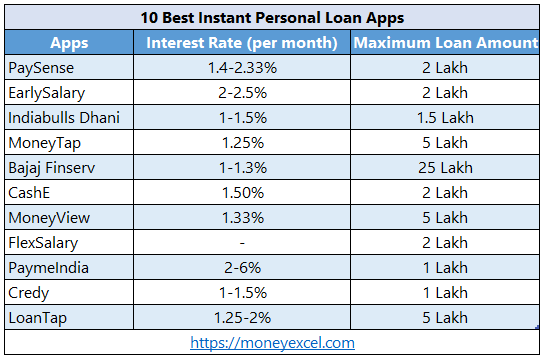 Here is List of 10 Best Instant Personal Loan Apps for your quick cash requirement. PaySense is an online platform to get an instant personal loan. PaySense has partnered with IIFL and Fullerton for disbursal of personal loan. A PaySense app is available on Google Play. You can install PaySense app and get a personal loan for medical emergencies, marriage expenses, buying a two-wheeler or any other requirements. The maximum amount of loan permissible by this app is 2 Lakh. The rate of interest rate starts at 16.8% annum. The loan amount and tenure are decided based on risk profile. You need to submit KYC documents along with bank statement to get a loan. It will take 3-5 days to get a loan using this app. EarlySalary is projected as salary advance and Instant Personal Loan App. You can get loan ranging from Rs.15000 to Rs.2 Lakh using this app. No credit history required for availing loan using this app. This app can be used at Amazon, Flipkart and Big Bazaar for easy EMI purchase. The interest rate applicable on loan amount is 2-2.5% per month. EarlySalary app can be used to avail loan at specific cities. You need to pay 2% processing fee for availing loan using this app. Indiabulls Dhani is one of the best personal loan apps. It is backed by Indiabull ventures. You can get unsecured Instant personal loan instantly using this app. The best part of this app is no physical documentation required and interest rates are very low 11.99%. You can get personal loan up to 15 Lakh using this app. The processing fee of loan is 5%. To get loan using this app, you need to download this app and provide your PAN number and address for verification. After entering loan amount, you will receive loan amount in your bank account within minutes. MoneyTap is among best instant personal loan apps where you pay interest only on the withdrawn amount. MoneyTap has partnership with leading NBFCs in India. You can get an instant personal loan online with zero collateral and interest rates starting from as low as 13-24.3% pa for 2 to 36 months duration using this app. The maximum loan amount offered by this app is 5 Lakh. You just need to download app and apply online by creating your profile and uploading documents. You can find out pre-approved loan amount before applying. CashE provides instant short-term personal loans to young professionals based on their social profile, merit and earning potential using its proprietary algorithm based machine learning platform. CASHe is completely automated and requires no personal intervention and no physical documentation for availing personal loan. You can avail loan from Rs.5000 to Rs.2 Lakh using this app. The interest rate applicable on loan is 1.5% per month. MoneyView offers instant and paperless personal loans. You can take quick and easy loan by using MoneyView App. You can avail loan up to amount Rs.5 Lakh using this app. It is completely app based, no physical document required for availing loan. Annual interest rate varies from 16-24%. Processing fee is in the range of 2.5-4%. FlexSalary is also known as salary advance and instant cash loans app. This app offers loan to salaried people up to 2 Lakh. To apply loan via FlexSalary, you need to sign up or login via social account. After filling up basic data and PAN card detail your application will be submitted for approval. Once your loan is approved you will receive amount directly in your account. PayMe is an innovative FinTech app which offers short term loan or quick cash support to corporate employees. The primary focus area of this app is to address quick cash requirement of salaried. The maximum loan amount offered by PaymeIndia is 1 Lakh. The interest rate applicable on loan amount is 2-6% per month. Credy is next in the list of best instant personal loan apps. It offers fast and hassle-free loan with paperless process. Maximum loan amount offered by Credy is 1 Lakh. One drawback of this app is it offers loan in selected cities – Banglore, Chennai, Pune and Mumbai. The interest rate applicable on loan amount via this app is 1-1.5% per month. AnyTime Loan is online P2P lending on go platform. It also act as a personal loan apps.This app provides a loan to both salaried as well as self-employed individuals. AnyTime Loan offers unsecured loans for your personal requirement. The maximum loan amount via this app is 10 Lakh. Annual interest rate varies from 18% to 54%. Note – I have not used any of the app mentioned above for availing a personal loan. Information given above is collected from various sources. Readers are requested to carry out due diligence exercise before selecting a lender. Do you use any of the Instant personal loan apps given above? Do share your experience in the comment section given below.